here for free). Windows Live Movie Maker may not be as sophisticated as other professional programs like Adobe Media Pro or Avid Media Composer, but it is a good tool to learn the basics of video-editing in film-making. This tutorial will introduce you to the different features of this program with respect to the various aspects of post-production video-editing. Hopefully, by the end of this tutorial you'll be able to apply these to complete your movie project. Identify, sort, and save all the files you'll be using in a single file folder, preferably with separate sub-folders for images, videos, sound effects, music, etc. When the files have already been imported to a Movie Maker Project file (*.wlmp), DO NOT move these files to other locations. DO NOT move the main file folder (and sub-folders) of the imported files in the project. Doing these will not only make searching/locating of files faster and easier, but these will also be especially crucial in properly maintaining all the imported files in the project files. Movie Maker 'remembers' the last known location of all the imported files - so any changes with the file locations, or even file names would lead to missing files in a project. After all the necessary project files have been properly organized, it is now time to import them into the Windows Live Movie Maker. 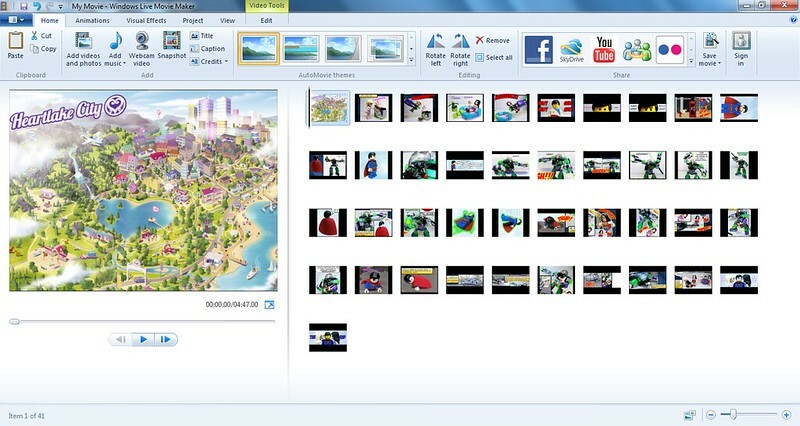 The pictures and video clips can be imported by clicking either of the two Add videos and photos button (one at the Home tab and the other at the storyboard) > locate the file folder(s) > select all the files to be used for the project > click Open > the files will be imported in the storyboard/timeline. 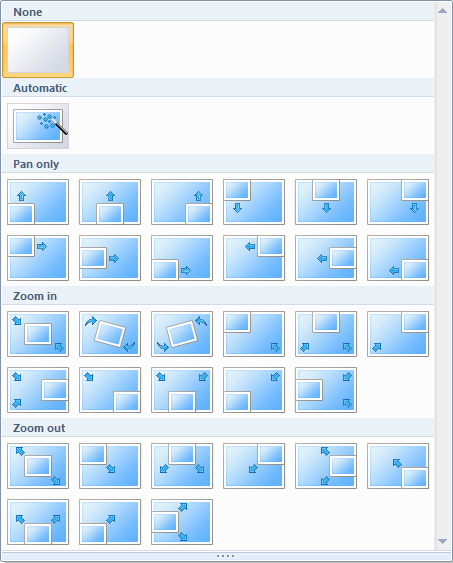 Below is the view of the imported images in the storyboard. Note that you have the option to change the sizes of the images in the timeline depending on your liking. 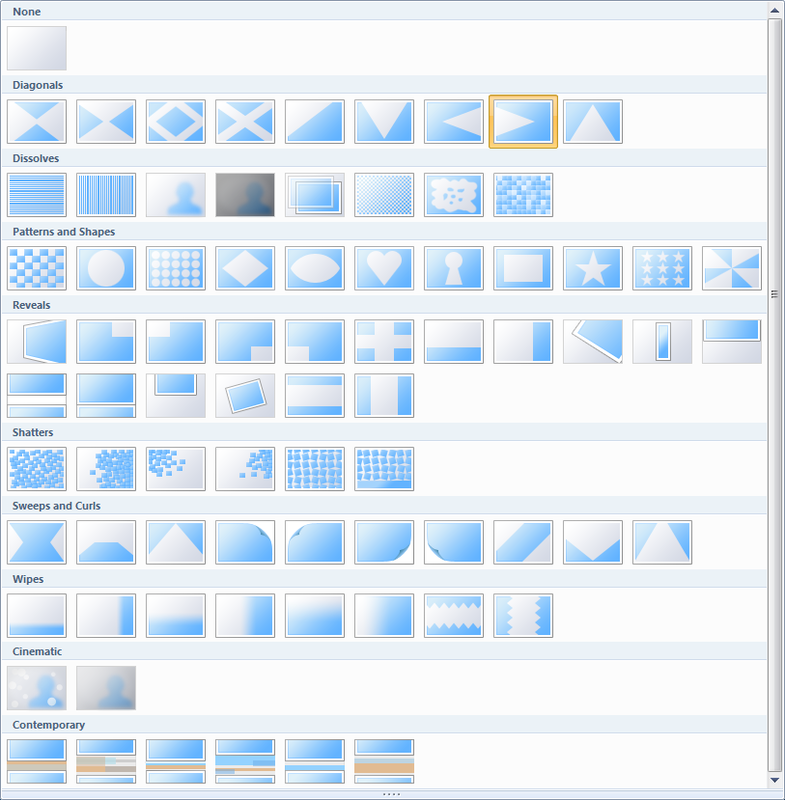 To do this, just click on View and choose the size you want (I personally prefer the Extra-small icons thumbnail size since I could view the overall storyboard better). If you are making a music video-type project, you should import the music file this early since the music will dictate how the images/videos will be edited in the timeline. To import the music file just click the Add Music icon (you have the option to add your music at the start of the project or at specific parts of the timeline) > locate the file folder > select the music file > click Open. As a good practice, it is recommended to save the project file this early: click the File Menu icon at the top-left corner > select Save Project As > choose the folder location to be saved (the same folder for the project files is recommended) > type in the File Name > click Save. Move the image and movie files according to the order of appearance in the movie by manually dragging the thumbnails left/right/up/down. You could also use the Cut-and-Paste shortcut command by selecting and cutting (Ctrl+X) an image or a video and pasting it (Ctrl+V) to the desired point in the timeline. Note that this is where the pre-organization of files will prove to be beneficial - if you re-named your files in chronological order then they will be imported and placed in the timeline in the same order - so no need to move and arrange them one-by-one. Split Tool: enables you to split your video into two or more segments by moving the vertical bar to the specific point/time you'd like the video to be split and clicking the Split icon. Click on the Trim Tool icon > a new sub-toolbar will appear > set the Start point and End point by typing in the exact times or clicking the up and down arrows > click Save Trim. Split Tool: enables you to split your music file into two or more segments by moving the vertical bar to the specific point/time you'd like the music file to be split and clicking the Split icon. Set start time: allows you to set the point in the timeline when you'd like the music to start playing. You could do this by either typing in the exact start time or clicking the up and down arrows. Another alternative method is to manually drag the music bar to the point in the timeline you'd like the music to start playing. Set the Start point and End point by typing in the exact times or clicking the up and down arrows. Duplicating Files: you may copy images/videos/music files by simply selecting the thumbnail/item > click the Copy icon or press Ctrl+C > paste it on the specified point in the timeline. 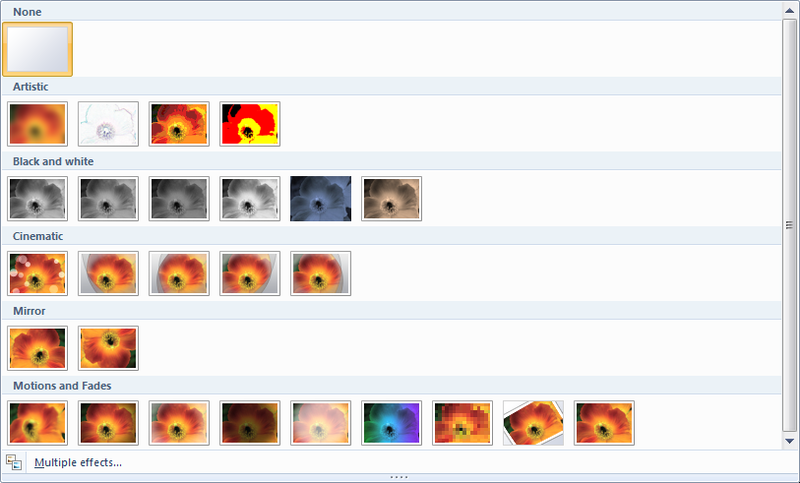 Note that the copied file will have the same added effects (transitions, pan & zoom, etc.) as the original file. Removing Files: just select the file(s) you'd like to remove and click the Remove icon or simply press the Delete key. Selecting Files: you may select a single file (clicking on a thumbnail/item), multiple files (batch selection using Ctrl+mouse click or Shift+arrow keys), or all files (clicking the Select all icon or pressing Ctrl+A. Rotating Images/Videos: click on the Rotate Left or Rotate Right icon to change the orientation of your images or videos (useful if proper re-orientation of images was overlooked prior to post-editing in Movie Maker). 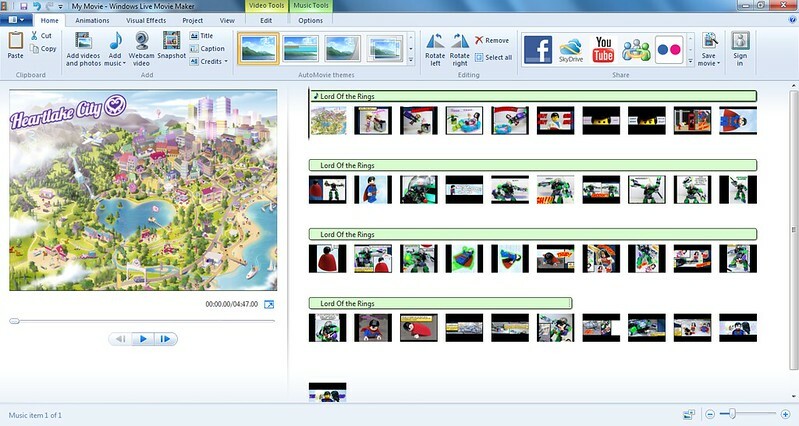 Movie Maker comes with several sets of special animation and visual effects that you could use to add more 'spice/flavor' to your movie. These include transition effects, pan and zoom effects, visual effects, and pre-set AutoMovie themes. Click on the Animations tab > click the drop-down button > hover the cursor over the thumbnails to see the preview of each transition in the preview screen > select your chosen transition effect. Set the time duration of the transition either by typing in the exact time or choosing from the pre-set time durations (from as fast as 0.25 seconds to as slow as 2.00 seconds). Playback and review the transition effect in the preview screen. Adjust the time duration as needed. If you intend to use the exact same transition for all your pictures and video clips, just click the Apply to all icon to apply the selected transition to all images and videos in the timeline. If you want to only apply a certain transition effect to a select number of pictures and video clips, you can use the Ctrl+arrow key or Ctrl+Shift to batch select the items and then click the transition you'd like to use and set the time duration. The transition effect will be applied to all selected items in the timeline. To change or remove transitions, simply click on the image or video and choose No Transition or choose other transitions. REMINDERS: While adding transitions can be exciting in giving your movie a distinct professional look, bear in mind that these effects should be used wisely so as not to risk overdoing it. Use transition effects only when the change in scenes calls for it. For stop-motion films, obviously it does not make sense to apply transitions between small changes in action poses. The number and type of transitions to be used would depend on the type of project you're doing. For example, romantic music slide shows may require slow dramatic transitions (like Fade, Overlap, Blur) between images while an intense action-packed video with fast and abrupt changes in scenes might not require transitions at all. Timing is very important so transitions would have to be in-sync with the background music or sound effect (a slow 2 second transition would not go well with a fast-paced change in music). Select the picture or video clip you'd like to add an effect on. Click on the Animations tab > click the drop-down button > hover the cursor over the thumbnails to see the preview of each effect in the preview screen > select your chosen pan & zoom effect. Playback and review the zoom effect in the preview screen. Change or removeeffects if needed (click on the image or video and choose No pan and zoom or choose other effects). If you intend to use the exact same pan and zoom effect for all your pictures and video clips, just click the Apply to all icon to apply the selected effect to all images and videos in the timeline. If you want to only apply a certain pan and zoom effect to a select number of pictures and video clips, you can use the Ctrl+arrow key or Ctrl+Shift to batch select the items and then click the effect you'd like to use. The particular pan and zoom effect will be applied to all selected items in the timeline. REMINDERS: Much like with adding transitions, pan and zoom effects should also be used appropriately to yield good results for your project. Use pan and zoom effects only when they're applicable to the scene(s). Since the pre-set pan and zoom effects is not customizable (directions, speed cannot be changed), its use can be limited to music slide-shows or select portions within a movie project. In cases where pan and zoom effects are applicable to use, the number and type of effect to be chosen would depend on the type of project, but generally for music slide show videos it is recommended to use a 'good number' of pan and zoom effects - not sticking to one type to avoid visual redundancy nor too many effects to prevent an overdone look. Like transition effects, timing is also important and the pan and zoom effect should be in-sync with the background music or any accompanying sound effect. Select the image/video you'd like to give a visual effect > click the Visual Effects tab > choose your desired effect. There is also a brightness adjustment setting you could use for your images/videos. Like with the transitions and pan and zoom effects, you have the option to apply a certain visual effect to all of your images/videos by clicking the Apply to all button. There is also a special option where you could combine two or more visual effects together. You could access this by clicking the drop-down list > go to the bottom of the list > click on Multiple effects > select the visual effects you'd like to combine from the list of Available effects on the left to the list of Displayed effects on the right > click Add > click Apply. The resulting combined effects will depend on the chosen effects - some may work well together, some will result in one effect overpowering the other(s), etc. It would be up to you to explore and decide what's best for your movie. Much like the other animation effects, visual effects should only be used when they're deemed appropriate or depending on the artistic taste of the film-maker. Movie Maker also offers AutoMovie themes which you could use to instantly give your project the necessary movie elements in just one-click of a button! Each AutoMovie theme comes with its own pre-defined set of animations and visual effects that serves as a guide/suggestion on what you could do with your set of images and video clips in your timeline. The AutoMovie themes can be accessed under the Home tab, and by clicking on a selected theme, its pre-defined animations and visual effects will automatically be applied to your images and video clips in your storyboard. You have the option to adjust your images and videos to fit the theme or adjust the theme settings to fit your set of images and videos. The AutoMovie themes are perfect for quick 'fun movie projects', but for more serious projects it is recommended to take the more tedious but more customizable route of post-editing individual movie elements. Text can also be added in your movie project in the form of titles, captions, and credits. These three differ in their locations within the timeline: titles are added at the start of the movie, captions added in the middle, while credits are added in the end. These can be added by clicking either the Title, Caption, or Credit icons in the Home tab > a text box will appear in the particular slide or image/video > type in the text > re-size the text box dimensions as needed > move by dragging the text box to the desired area in the screen. Texts appear as peach-colored bars at the bottom of the pictures and video clips in the timeline (see example below of the three text files within the timeline). Font Settings: enables you to change the font type, font size, font color, bold, italicize. Paragraph Settings: change the text alignment (left, center, right) and the transparency of the text. Edit Text: allows you change the text. Background Color: enables you to change the background color (whole screen) of titles and credits, but not of captions (since they are positioned over images and videos). Start Time: set the time when you want the text to start showing in the timeline by typing in the exact time (in seconds) or using the up/down buttons. Text Duration: like with images and video clips, you could set the length of time you'd like the text to appear in the movie (by typing in the exact time or selecting one of the pre-set time durations). Effects: text also have animation options like images and video clips. Simply hover into the thumbnails in the grid (more in the drop-down menu), choose and select the text animation you like. For projects with existing music in the timeline: finish first your movie project without the sound effects/voice-overs and save your movie. 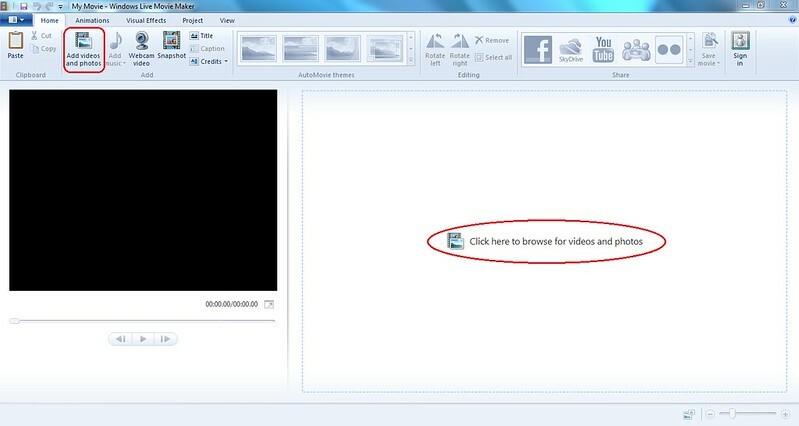 Then open your movie file in Movie Maker > identify the exact point/time in the video where you'd like to add a sound effect or voice-over > add the sound effect/voice-over file via the Add music button > edit the sound settings in the Music Tools (start time, start/end points, fade in/out). You may also adjust the volume of the added audio file relative to the video music by clicking on Project > Audio Mix > adjust the volume to your liking (higher volume for the video music or the sound effect/voice-over). Audio Mix - enables you to set the music and video to play at the same volume, or play one louder than the other. Fit to music - automatically adjusts the duration of photos so the movie and music end at the same time; this is primarily used for quick fun projects but not advisable for projects requiring proper timing of photos and music. [*]Aspect Ratio Options: use either the Standard (4:3) or the Widescreen (16:9) aspect ratio for your movie project. TIMING IS EVERYTHING: Make one initial viewing of the whole movie and keenly observe for the timing of the minifig movements, scene transitions, visual effects, sound effects, and background music with respect to each other. Ideally, all the movie elements should be in-sync together overall. Record any off-timed elements and the exact times of occurrence so these could be corrected accordingly. Correcting Issues: After gathering all the findings in the initial viewing, correct all issues observed (if any). Final Review: Make one last final viewing of the revised movie. If everything is ok, you can now save your movie. Otherwise, revise again until you're completely satisfied with the final product. Saving the Movie: In the Home tab, click on the down arrow in the Save movie icon > select the quality of the movie to be saved (either the recommended setting for the project, for high-definition display, burn for CD, for computer, email, mobile devices, or even set your own custom quality settings) > type in the file name > click Save. The movie will be saved in the default Windows Media Video File (*.wmv). You may need other video converter programs if you want to have your movie in other video file formats. Sharing your Movie: Movie Maker allows you to share your movie directly from your project file to online video-hosting sites like YouTube, flickr, Facebook, SkyDrive, and Windows Live Groups. Simply click the icon of the site you'd like to upload your movie to > choose the quality settings of the movie > Movie Maker will save it (again) and upload it to the specified site (you may need to log-in to the site and continue the uploading process online). No transitions were used for most of the images for them to be in-sync with the sudden changes in the beat of the background music. "Blur-through black" transition were specifically used for the scenes where Superman got struck by Lex's Kryptonite Blaster (at 1:29) to give the scenes a dramatic effect. [*]Use of Text: I used a Credits to add the text caption in the end to ask a hanging question. Here are a couple of examples to illustrate how the various features of Movie Maker can be used effectively in a movie project. Even if there are a lot of great brickfilms around, I specifically chose these two videos as examples for their simple yet effective and noticeable use of video-editing elements. Transitions: I prominently used a combination of "Overlapping" and "Blur-through black" transitions for almost all the slide transitions to produce a dramatic (and hopefully romantic) reminiscing effect. Use of Text Captions: I highlighted some lyrics of the song (with some slightly tweaked) in the form of Captions (mostly using the "Zoom In-small" effect plus the snazzy "Cinematic Burst" effect in the end). Timing with the Music: As always, I made it a point to time the transitions and text captions to be in-sync not only with the beat of the music but the exact lyrics of the song for the text captions. Minimalistic Movement: The movements may be minimal but they fit well with the simplicity of classic 70s/80s music videos, particularly the music in this video, Queen's Bohemian Rhapsody. Moreover, the subtle movements are perfectly timed with the music and visualizes the lyrics accurately. Piano at 0:49 - Nice! "Scaramouch, scaramouch will you do the fandango" scene at 2:04 - Very nice! "I'm just a poor boy..." at 2:24 - then the group singing at 2:24 - then back being alone at 2:32 - Wow! The "Let him go" scene at 2:41 with the "appearing-disappearing act" the trio of Pancho Parrot, Gilda Goat, and Edgar Elephant - EPIC!!! [*]Visual Effects: The negative polaroid effect for the "Thunderbolt and lightning" scene at 2:14 is just spot-on! 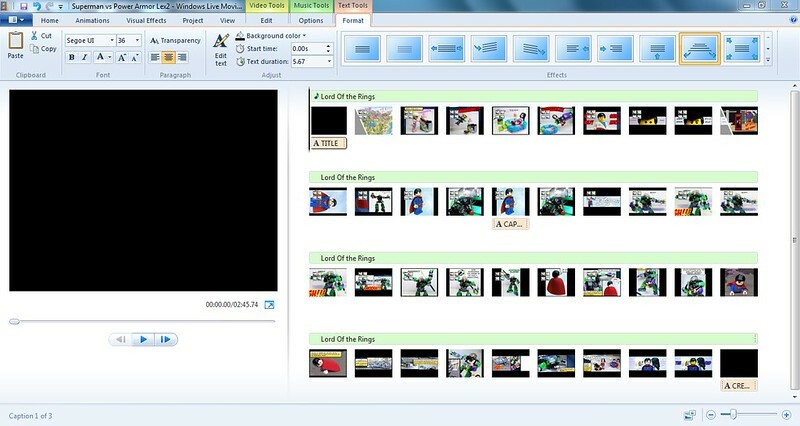 Now that you know the basics of video-editing using Windows Movie Maker, you can now start embarking on this exciting and rewarding task of completing your movie project! As always, this tutorial serves as a general guide but ultimately the choice of the visual effects, animation, etc. would depend on the type of project and of course, the personal creative taste of the film-maker. For any questions, clarifications, comments, and suggestions feel free to post in the Questions & Answers Thread.